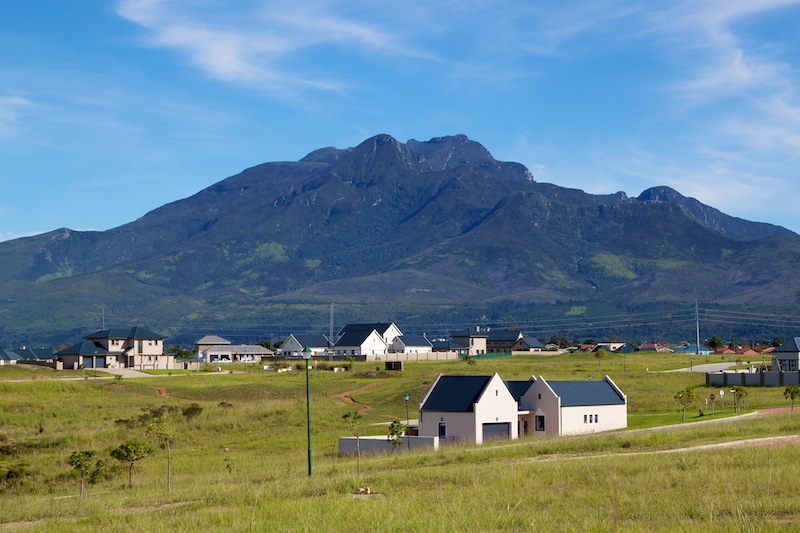 Blue Mountain Gardens Security Estate is situated in the fastest growing real estate node in George. It is on the Eastern side of George as you approach the Garden Route Mall. If one were to drive a little further you would end up in Victoria Bay or the village of Wilderness. The area around the mall totals around 120 hectares of which 80 hectares forms the security area of Blue Mountain Village & Blue Mountain Gardens. This in effect gives rise to the largest security estate in George. Fantastic views of the stupendous Outeniqua Maountain Range. Blue Mountain Village. Sunset views down the Outeniqua Mountain Range are magnificent. The Southern side is bordered by a deep valley with a river and the "Outeniqua Choo Tjoo" railway line. The Eastern side is bordered by an open area destined for offices and beyond this is the Garden Route Mall. Views to the East are are spectacular sunrise over the Outeniqua Mountain Range. The estates have gone the extra mile in security with advanced planning by experts. The architectural language of both developments offers excellent control and beautification of the area - architecturally themed developments offer higher long term rewards than uncontrolled suburbs. The architectural guidelines can be downloaded from the web site. In a nutshell - the best opportunity of a controlled investment in the George area.